Bloody hell. What a find! I've tweeted for help on the date. CP Lee says the Magic Village opened early 1968. Hi Abigail & CP Lee, are there any local papers that listed gigs in Manchester, that you'd recomend, in 1968 ? the more 'underground' the better ! The spelling of the band is with one "n" and I believe this is an early spelling. Their fan club membership card also had one n so I am guessing this poster was done before any record release! M.V. opened Saturday 9th March (with a set by Jacko Ogg). The first Tyrannosaurus album came out 5th July. The poster says that Tyranosaurus and Jacko will only appear on Saturday. That gives us only 16 likely dates. Take away known Saturday gigs (such as 13 April, Royal Festival Hall) and you have even fewer dates. Clive, you have accounted for another two Saturdays and I have found an advert for the Magic Village showing the bands booked for June and July. That all narrows it down to 8 probably dates:March 16, 23 or 30, April 6. 20 or 27 and May 4 or 11. If we make the big assumption that the gig was to promote the single (Debora, released April 19), then we have 4 possible dates. A friend of mine is a Tyrannosaurus Rex researcher, and he makes it 20/4/68 ? Don't know the date but when I went to the Village to see them, with John Peel in the dj box, they didn't turn up ! Cream had just released their first single Anyone for Tennis. Anyone for Tennis was released in May 1968...so sometime in May ? Although I don't have the book to hand, I believe there to be a full list of the Magic Village gigs in the book called "Roger Eagle, "Sit Down! Listen to This!" by Bill Sykes. This definitely has a date of March 16, 1968 for a Tyrannosaurus Rex gig (though it is essential to check if any other dates for 1968 are mentioned). 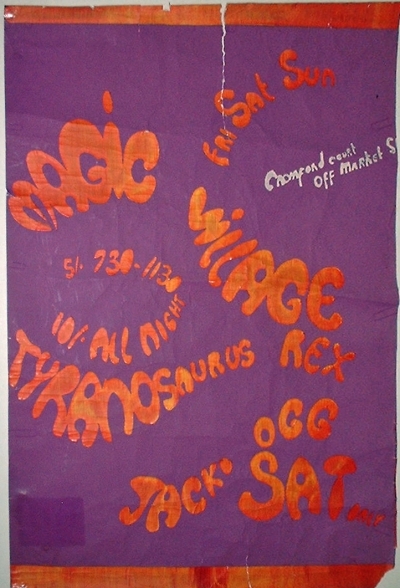 It doesn't list the support band, but some of us involved with tracing Van der Graaf Generator's gig history are of the opinion that this gig may also have featured VDGG, because Peter Hammill and Judge Smith remember supporting T. Rex at least once at the Magic Village and did a gig of their own there on April 28th,1968. Whilst it is possible that this latter gig is the one with T. Rex, it would seem from the online discussion that T. Rex were elsewhere on that night. So, would it be possible to find out if perhaps Van der Graaf did also support T. Rex on the 16 March, either in addition to, or replacing Jacko Egg. I hope I've been able to help with confirming the date of March 16. Yeah March 16th 1968 is almost certainly correct. I went and joined the club that evening ( there was a window close to the front door where you signed-up and paid to join; a kinda box-office I guess) . Didn't actually go into The MV until later that evening... Because it didn't serve alcohol...so The Bier Keller came first. When we did get in at around midnight, messers Bolan and P-Took played a nijce set. Van Der Graf were students from the Uni, and played electrified acoustic guitars through little crappy amps and using the small speaker to get feedback. Steve P-T played bongos during the VDGG set. I also picked up a copy of the poster (think I nicked it off the wall near the box- office window as I left). Great poster- hand drawn/written ;deep blue background with lettering in a deep orange/red colour applied with thick acrylic paint. Wonder where I lost that?